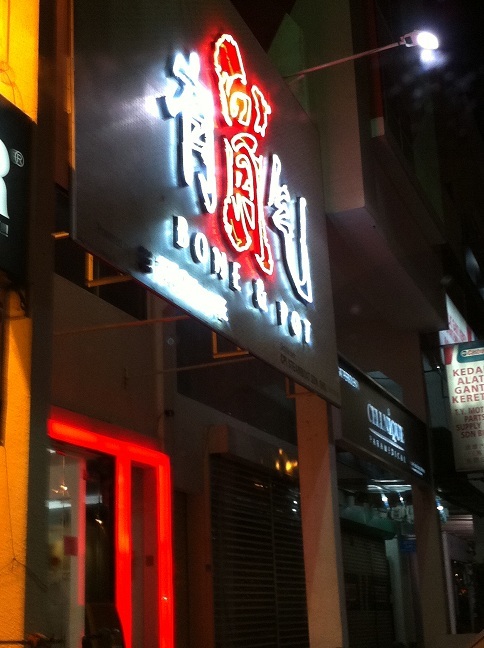 WL promised to take me to this steamboat restaurant to try out & the day had finally came. After work, we drove straight to Uptown Damansara before the heavy traffic started to build up just before the toll to NKVE. When we arrived, it was drizzling...a plus point since we're eating steaming hot food today to balance off the heat. Judging from the bright neon lights outside the restaurant, it looks pretty eye-catching from the highway. We ordered two different soups - signature pork bone broth & black pepper pork broth - plus other ingredients as our main dishes. Since this steamboat is ala carte style, we were quite selective on the ingredients as the price tend to be rather pricey. These were some of the ingredients that arrived at our table. 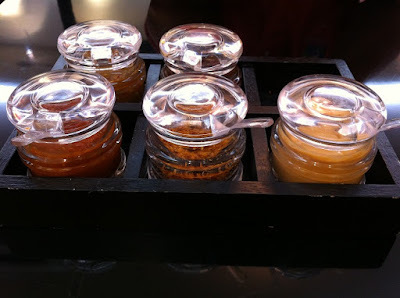 The unique aspect of this restaurant is that it provides 5 different sauces to suit your varying taste buds - from spicy to sour. Though I quite fancy the dried chilli flakes similar to those used in dried pan mee, it was a pity that I couldn't consume much due to its spiciness. While waiting for the rest of the ingredients to be served, we poured some of them into the broth & brought it to a boil. Seeing the boiling pot each time makes me go hungry. Yum! 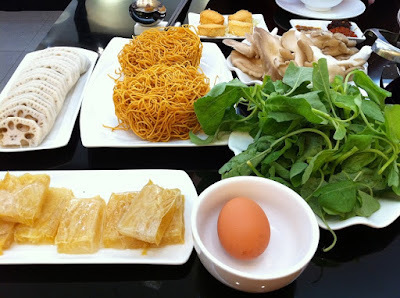 What I really liked about dining here was the comfort of eating boiling hot food without sweating it all out. The heat source comes from an induction hob installed on each table to keep the broth at boiling point without releasing heat to the surrounding. 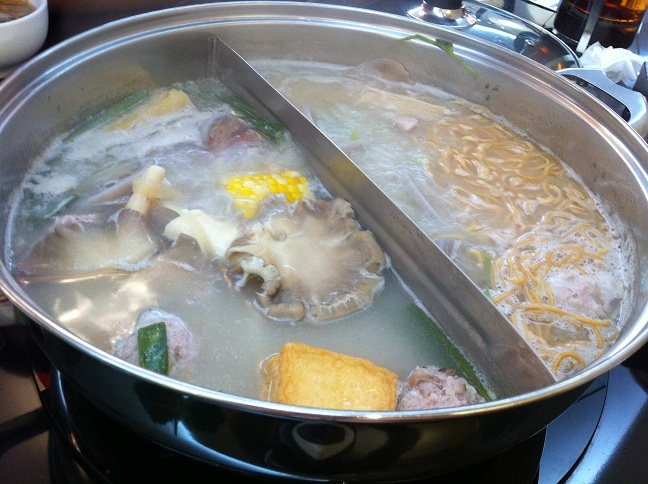 Not only we felt less heat, eating steamboat becomes less messy & most importantly safer than ever before. Our only complain (like what I've mentioned earlier), the price was rather steep with their choices left much to be desired. Maybe cuz we were too used to eating buffet style steamboat which offers variety at an affordable price. 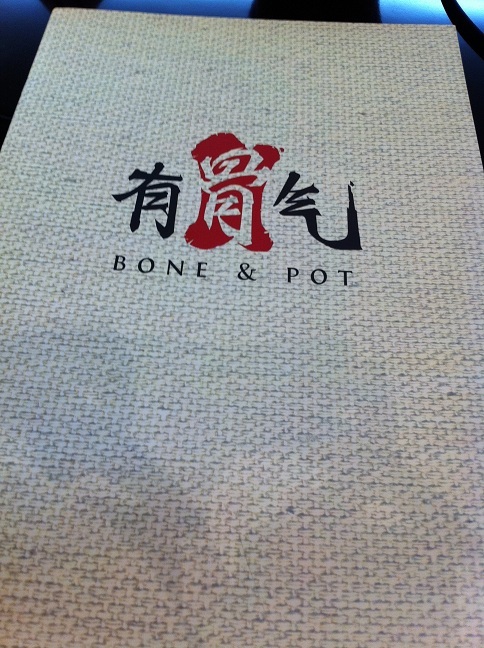 Overall, Bone & Pot is alright but it wouldn't attract us...or at least me for another visit. It wasn't that worth it, if you ask me.